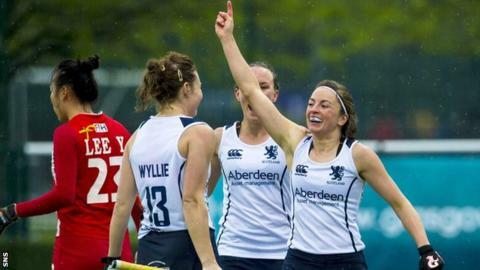 Scotland's women will play South Africa in Thursday's quarter-finals of the FIH Champions Challenge in Glasgow after the hosts drew their final pool match. Linda Clement netted twice as the Scots came from behind to lead Korea but Eun Jong Kim levelled, with Ju Ok Kim having opened the scoring. Earlier in the tournament, Scotland had lost to Belgium before beating India. Korea play Ireland in the last eight, Belgium take on Spain and USA face India. Scotland head coach Gordon Shepherd told the Scottish Hockey website: "I'm happy with the result [against Korea]. "The players played well and took the game to the Koreans when we needed to and at the right times, earning a lead from it. "It was a great position to be in, especially against a team ranked seventh in the world. Korea are going to the World Cup in a few weeks and we knew we'd have to defend well. I thought every single player was great in that respect. "We took points off a team ranked higher than us and we're improving all the time. We asked the players to play with confidence and it showed. We have to keep that belief in ourselves and this team could achieve a lot more."